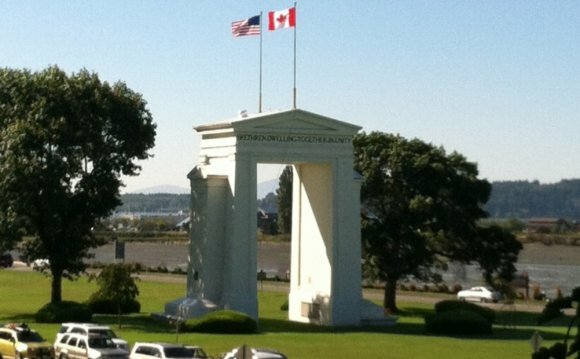 The Peace Arch stands astride the international boundary between Blaine, Washington and Douglas, British Columbia. The Arch was constructed to commemorate the centennial (1814-1914) of the signing of the Treaty of Ghent on December 24, 1814. The Treaty of Ghent ended the war of 1812 between the United States and Great Britain, a conflict that involved Americans, as well as Canadians and British. In 1914, the international fund raising efforts for the Arch were spearheaded by Samuel Hill, famed Washington State lawyer, financier, road builder and humanitarian, who would later dedicate it on September 6, 1921. The Arch's design was donated by H.W. Corbett of London, England, an internationally known architect. Construction began under an international force of volunteers in 1920. Standing 67 feet high, the Peace Arch is made of concrete and reinforced steel. Its foundation consists of 76 fourteen inch pilings driven 25-30 feet into the earth. The Arch was said to be one of the first structures in North America constructed to be earthquake proof. In 1931, the expansion of the park to 40 acres was developed with the help of school children from Washington State and British Columbia who donated their pennies, nickels and dimes to the project. The International Peace Arch is one of the few landmarks in the world listed on the National Historic Registries of two different countries. Coming home thru Peace Arch, Blaine, Wa.